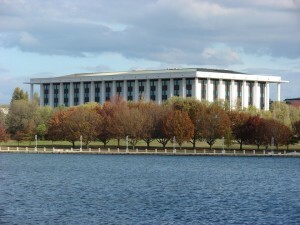 The National Library of Australia building in Canberra, opened in 1968, designed by Bunning and Madden. 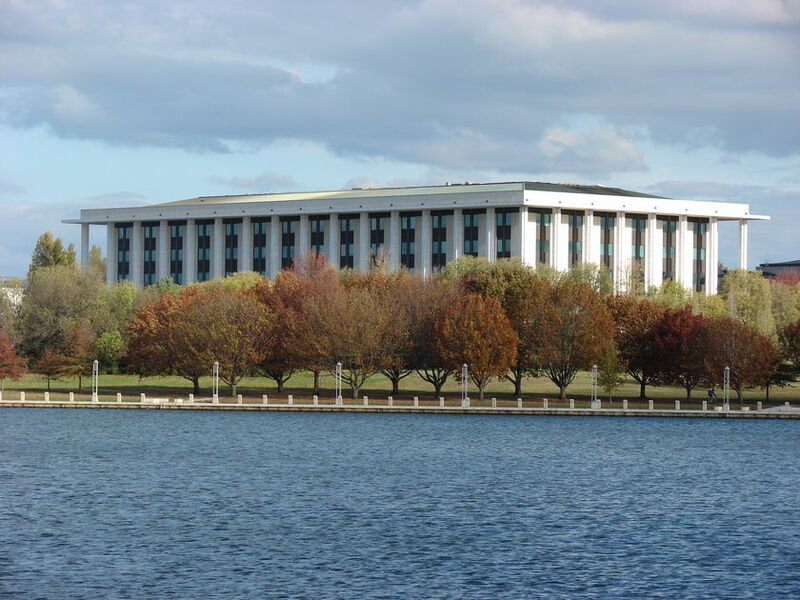 The National Library of Australia (NLA) has begun a process to archive the douglas-snelling.com website via its PANDORA system to capture online information for access by future researchers. The NLA uses a robotic online 'spider' system to scoop site data and metadata that allows digital reproduction of a 'snapshot' for reading even if/when the site is closed. The PANDORA system can be programmed to update site snapshots at regular intervals and the archive is accessible from Australia's state libraries. The douglas-snelling.com blog was set up in 2012 by Snelling's biographer, Davina Jackson, to 'rescue Douglas from a dumping' by past and present supporters of Harry Seidler and Snelling's other younger rival architects since the early 1950s. Jackson's RMIT scholarship PhD thesis on Snelling was wrongly failed, via political manipulations of various formal processes from 2007 to 2011, as part of what is now recognised as the 'anti-Douglas and Davina campaign'. The NLA's decision to archive this site follows a 27 March 2014 lecture on Snelling, given by Jackson and Snelling's eldest son, Christopher Snelling, to members of the modern architecture conservation groups Docomomo and ICOMOS. This lecture, brokered by Docomomo Australia's secretary/treasurer Louise Cox, ended a 10-year blockage of Jackson's Snelling research by other current Docomomo Australia leaders, supported by their counterparts in New Zealand. NZ footnote 11 April 2014: Administrators at the National Library of New Zealand have decided not to archive this site because of the NLA decision to preserve it. The NLNZ's Digital Collection Strategy Leader, Mark Crookston, said: 'we take a global, holistic view of documenting the web, which enables NLNZ to focus on the challenges of documenting the NZ-based web presence' (noting that the Library can focus on 'some international sites from NZers and about NZ that are not collected by one of our international collegial institutions'). The New Zealand Institute of Architects is failing to respond to our requests for a comment on the refusal by NZ scholars to recognise Snelling's relevance to NZ modern architecture and design.